Dr. Peter Blood, a peaceable surgeon who goes to the aid of a wounded rebel, finds himself on trial for treason against the English king. Transported to Bridgetown, Jamaica, Blood becomes one of Colonel Bishop's slaves, but rather than toil in the field, he ministers to the sick citizens, including the governor. This incursion into the profits of the two doctors already on the island causes them to abet Blood in his attempt to escape the island. A Spanish raid interrupts their plans, but ever resourceful, Blood and his mates turn the tide on this new enemyrescuing the town while capturing a better ship to begin their lives as pirates. He names their ship after Arabella Bishop, the colonel's niece. In quick order Blood establishes a reputation among the brotherhood, but a partnership with another equally infamous pirate turns to deception and death. Twice he rescues damsels in distress, but the second oneArabellaspurns his love because he is a pirate. He eventually accepts that fate has dealt him a hand he never expected, nor wanted, but the ouster of the Royal House of Stuart and war between England and France might just change his mind. Many years have passed since I first read Captain Blood after seeing Errol Flynn bring Sabatini's character to life on film. This Colonial Radio Theatre production is true to the original book, so listening to them dramatize the novel was like visiting an old friend. Sound effects make the action real, while the actors bring the characters to life, enhancing this historical romantic adventure that is the epitome of a swashbuckling tale. 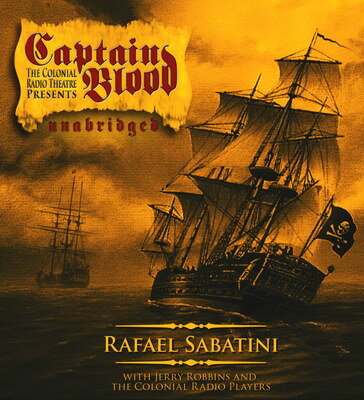 Fans of Sabatini will want to add this to their collections, and those only familiar with Flynn's interpretation will want to meet the real Captain Blood. The price is steep, but well worth the investment. Blackstone Audio does, however, offer rentals of the audio for $14.95. Since this article was written, Blackstone Audio has released a consumer version of this title for $19.95. It is available directly from them, at Amazon.com or at Borders Books. Last updated 27 February 2008. Review Copyright ©2006 Cindy Vallar. Any concerns or problems about this site, please contact rimfire.